In June of 1943, National Socialist Germany, along with the Empire of Japan, began what became known as World War II, or the Nine-Month War. Having annexed Austria in late 1942, Germany already had additional bases from which to flank the Czechs. Poland and Czechoslovakia immediately joined the ‘Greater German Reich’, allowing German troops to cross their borders unhindered as half a million German troops crossed into Russia. Six weeks after entering Russia, Moscow fell to overwhelming German military superiority. Stalin, attempting to flee, was dragged from his private train car and lynched along with Beria, Molotov, and several other party apparatchiks. Russia out of the war, Hitler turned to France and England. His lightning attacks through the Netherlands and through the Maginot Line in early August of 1943 destroyed the French army in days. Simultaneously attacking the British naval base at Scapa Flow and savaging most British airbases with carrier-borne ME-262 jets, the British had little in the way of airpower or naval power by the end of the first week. Lindbergh, in his second term, could do little to help the British. The Kriegsmarine’s Type XXI submarines strangled British trade. With over sixty dedicated to the British Isles alone, no merchant shipping left or arrived in British ports for four long months. While the Kriegsmarine lost just two Type XXI’s, the actual tonnage of lost British shipping may never be known. Deprived of supplies, Great Britain could only wait for the inevitable invasion. By November, German paratroops had secured southern England and parts of Scotland. Having savaged the landing beaches by seaborne V-1’s, the Germans met little opposition. By January of 1944, with two German army groups converging on London from the north and south, Great Britain, after evacuating the royal family to Canada via Wales, surrendered. The Japanese victories and subsequent occupations at Pearl Harbor in Hawai’i and Dutch Harbor in the Territory of Alaska gave the Japanese bases from which to attack the west coast of the United States with relative ease. A minor American naval victory (which cost the Japanese three carriers out of twelve) off San Diego in January, 1944 did little to stop their advance. Securing and consolidating their holdings in the Philippines, Malaya, Indonesia, and the Solomons, the Japanese next turned their attentions to Australia and New Zealand. With no help from the Americans or their Commonwealth ‘mother country’, both nations rapidly signed peace accords with the Empire of Japan in early 1944. “Ja.” Oberst Adolf Galland was in the ready room at Trauen, smoking a cigar. The Trauen plant was now under Luftwaffe control, and was now called an “Atomic Weapons Branch” base. He was getting himself mentally ready to fly the Silbervogel again – this time on a real mission. “I must brief you, Herr Oberst.”, said the young Leutnant, a man named Werner. “Leutnant, I did finish gymnasium, you know.” Galland was impatient. Having to tell a Leutnant that he’d finished the German equivalent of high-school was the best way to get him to move along. Galland glared at the young Leutnant. He might as well have told Galland that he was a passenger, instead of a pilot. “They’re expecting me, Leutnant.” Galland stood to leave. “Good luck, sir!”, said Leutnant Werner. As with the first test, and two subsequent ones, Galland was helped into the cockpit, strapped in, systems tested, hoses and lines disconnected, and the craft made ready for launch. The bleachers, however, were gone – this was a military site now, not a research facility – it was the first launch-platform for an atomic weapons system. “Herr Oberst? Countdown commences now.” The voice through the helmet-headset sounded metallic. Still, it electrified him. Part of being a combat-pilot; he lived for the adrenalin and the excitement. Soon, the booster-engine slammed him into his seat. Within seconds, he was vertical. Seconds later, the booster shut down and was jettisoned. Like clockwork, the main engine fired, stabbing yellow-orange flame for a hundred feet beneath him; within a few minutes, he nosed the plane over, and began his run. “We let the Japanese do that, Goering.”, said Hitler. “We’re just honoring a treaty with them. Besides – after today, we will get to write the rules. All of them.” Hitler smiled at his own statement. — “Whaddya want? Ya readin’ or buyin’? I PAY for those magazines, ya know? Kids!” The news vendor on Broadway was busy, but there were always people who’d read and not buy. Chasing them out was a daily chore…. — “That’ll be a buck twenty-five, most likely, depending on traffic across the Washington. You in? Hustle up!” The cabbie woke up every morning knowing that dinner depended on a delicate mix of aggressive and friendly…. — “Twenty bid! Twenty bid! No higher!” The trader, on the main floor of the Stock Exchange, was trying to buy Packard and sell GM – there were rumors of war, and Packard was better-suited to build engines…. — “I love you, Elaine. Will you marry me?” The young man at the top of the Empire State Building was on one knee in front of a pretty blonde; everyone standing around the two beamed…. Below them, horses clopped through Central Park; sausage-vendors plied their trade in Little Italy; people in the Hamptons were likely just finishing breakfast; the privilege of money…. None of them noticed the parachute. None of them noticed the device at 1,000 feet over the Hudson. Then, there was only light and heat. In the center, there was no sound. Adolf Galland stood in the control center at the German space complex at Trauen. He was watching the telemonitors as Sanger’s latest creation, the German MoonShip (a cooperative venture between Messerschmitt, Blohm and Voss, and a dozen other contractors) began its descent. Germany was now the master of half the world. Russia was now providing cheap labor and raw materials for the Reich. Europe was German. So was most of northern Africa, and east through Palestine and Persia. Italy was an ally; albeit somewhat reluctantly. America had capitulated two days after the bomb fell on New York. 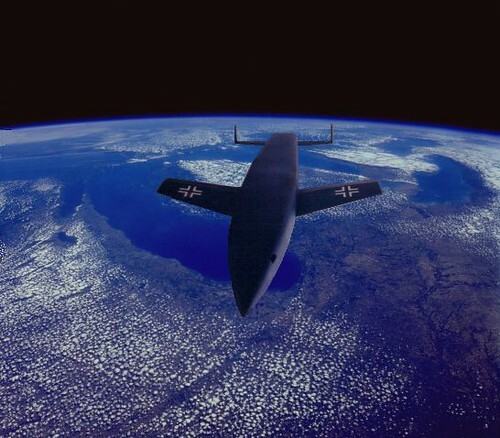 Constant overflights by German spyplanes and satellites saw to it that any ill-advised attempt by the U.S. to rearm would be brought immediately to the Reichschancellor’s attention…. “Down fifty meters; forward ten – I have a ground-contact light. Shutting down engines.” Major Wilhelm Heermann and Oberleutnant Walter Hewel – son of an early National Socialist diplomat – were the pilot and co-pilot of the first attempt to land on the moon. Aptly, they had named their craft the “Eagle”. There was a pause. Transmissions had to come from a staggering distance. Even Galland held his breath. A spontaneous cheer erupted. Germany had now conquered the moon itself. Two hours later, as Galland, VonBraun – now the head of the Reich’s Rocket and Space Agency – and the others in the Trauen control center watched the telemonitors, Heermann opened the ‘Eagle’s hatch, stepped on to a deployed-ladder, and took five steps downward, finishing by placing one foot on the lunar surface. “We come in Aryan brotherhood!”, he said, to more cheers from the assembled team. Galland grinned, ear to ear. “The ‘Eagle’”, he thought. “Not my ‘Eagle’ – but an Eagle, nonetheless.” Werner VonBraun slapped Galland on the back. “We wouldn’t be here without you, Herr Generalfeldmarschall”, said VonBraun, addressing Galland by his title. Galland had headed the German Luftwaffe since shortly after the end of the war; an iconic figure in the tradition of VonRichtofen. That much was true. Galland had championed the use of his pilots; seconded to the new Reich Rocket Space Agency. As to the ‘Silbervogel’, it was retired – now a museum-piece and taking on an iconic aura of its own; an inspiration for the craft – now two generations removed – which now sat on the moon. Almost unnoticed in the gallery was Werner Heisenberg. His mentor and friend, Eugen Sanger, had died three months before. Not given to emotion, he didn’t cheer. He smiled instead. Der Teufels Adler – (Eagle’s Nest) – Part V…. Goering entered Hitler’s study in the Kehlsteinhaus, or Eagle’s Nest – it had been presented to Hitler on his 50th birthday the year before in 1939; a present from the Party, instigated by Martin Bormann. Hitler didn’t use the place much, but when he did, it made the perfect retreat. Hitler broke Goering’s reverie with some impatience. “Goering! Did you see this?” Hitler was beaming; holding up a copy of the Zeitung and tapping the third page with a forefinger. The article was a small and rather obtuse feature; in it, there was news of a bright-red finned cylinder which had dropped from a plane by parachute, and popped confetti over the Manhattan Island shoreline. Local officials were trying to find out who had dropped it and what they were promoting, as there had been no permit issued, there hadn’t been a plane in the area and it wasn’t a holiday. Goering smiled, uncomfortably. The study was a small room, and he never did well in confined spaces. So that was Sanger’s secret?, Goering thought. He actually tested the guidance system as well? Good! Good! Such a list, thought Goering. Such a list. “Excellent!” Himmler, in his squeaky voice, chimed in. “Excellent! The Fuhrer will be pleased!” Himmler reminded Heisenberg of nothing so much as a weasel. Although weasels had a use in nature. Heisenberg was not so sure about Himmler. “We were already preparing feasibilities for Greenland. The northeastern peninsula of Christiaanland is unpopulated; no one would ever know we were there.”, said Heisenberg. Goering spoke with finality. “Get what you need from Raeder; tell him it’s from me. You will have your U-Boat, your crew, and anything else you need to haul this thing to Greenland and set it off. The Fuhrer is waiting.” Standing, Goering signaled an end to the meeting. “Yes, Herr Doktor. I can honestly say that without your focus and drive, I might not have done so.” Heisenberg was proud, as a boy would be after having proven he could multiply and divide. Sanger was happy; he’d been right, after all. Heisenberg had just needed a nudge. “Herr Grosadmiral, the specifications are as follows.” The representative from Blohm and Voss Shipyards was clearly nervous; this project had been in the works since its initial design in 1937, and it was, again, Goering who’d championed it. They were all justifiably proud of the result – giving the design to the Japanese had proven a master-stroke. “When may we expect the first ones?”, Raeder said. The Blohm and Voss representative wondered why the navy’s highest-ranking officer was dispatched from Berlin to perform a task that a junior engineer would have assigned to a courier – but strange things were happening nowadays; there was talk over at the aviation wing of new engines, and planes that didn’t need propellers…. “Ah! The Walter plant?”, said the representative. “Fiesler! Do they want to launch V-1’s from the deck?” The Blohm and Voss rep’s mouth was now open. Raeder turned, and left a very puzzled but motivated man behind. Summer was nearly upon them. Again, the maples and birches were in full leaf; the field-grasses in the distance were turning brown; if it were a hayfield, the farmers would be thinking already about the harvest. Instead, Heisenberg was thinking about the test. The math was right. They’d solved the main problem – how to create a reaction – and again, the simplest ideas were the best. It just required timing. They’d created a small analog device to trigger high-explosives in a precise order. These explosives were placed around the inside of the front-dome of the bomb. In front of the explosives was the plutonium core. If what they’d created really worked – and they’d tested it on a non-reactive target – the resulting shockwave would be ‘focused’ on the plutonium core, causing neutrons to spin off their nuclear ‘orbit’, and collide with other nuclei. The result would be the spontaneous release of the energy within matter itself – a ‘chained-reaction’ as he called it – which would, within a fraction of a second, release all the energy within the plutonium at once. The resulting explosion and destructive force would be staggering. They’d estimated it around ten thousand metric tons of conventional explosive. He could only guess at the damage something like that could do. Level a city? Part of a city? Destroy a whole army? Without one German life lost? It was worth it. “Ja.” Heisenberg didn’t even look up. He was involved in more administrative work; things were so secret that a lot of the product ordering – especially for the bomb – was left to the physicists themselves, and this was no exception. “The Blohm and Voss people are here for you.” Heisenberg’s aide was quiet and intense; respectful and invisible, at least most of the time. A half-hour went by; excruciating details, but they boiled down to this: The cylinder would work; it would store the bomb; it would be waterproof; it would resist pressures up to 1,000 meters if necessary, and it was lead-lined against any escaping radiation. That was all he wanted to know. That, and the fact that it was ready. It was time to go to Greenland. The temperature was anything but warm. Plus it was nearly midnight, and although low on the horizon, the sun was still up – something he’d’ve thought impossible otherwise, even in early June. While everyone was pleased that they’d beaten their test-date by two weeks, the seasickness Heisenberg endured on the way up to Greenland was torture, as well as the conditions. How on earth the submariners tolerated sleeping with each other’s presence so close-by was beyond him. It was like being a caged animal. The deck was welcome relief from the stifling confines, even if the temperature was still hovering around four degrees. The inflatable floatation-system created a ‘raft’ around the cylinder – a crane which had been shipped flat on the U-124 had been erected; the captain, a man named Mohr, had done his best to accommodate an unusual but critical assignment. “I don’t know what you’re up to – but Admiral Raeder himself told me that this was of the utmost importance. Skipping Admiral Doenitz was a breach of protocol – but I suppose rank has its privileges, eh?” Kapitanleutnant Johann Mohr was on the bridge with Heisenberg. Heisenberg vaguely heard the jovial and high-energy Mohr speaking. He was watching the progress. He’d brought several technicians with him; there was no need to go ashore, and he hadn’t planned on it. The cylinder slid off the deck in its inflated collar with a resounding splash. Sailors in inflatable dinghies lashed onto the collar and started small outboard motors. Pulling the cylinder, even in sheltered seas, would have been problematic, but in the stiff breeze there was a worry that it might just sink. After ten excruciating minutes, they had the raft on the sand. Hitting the quick-release valves on the collar, they guaranteed that the cylinder – along with its cargo – would go nowhere again. Heisenberg’s technicians fitted the receiver and antenna to the cylinder, and then headed back to U-124. All men safely aboard and with U-124 standing out to sea, Heisenberg thought that the cylinder looked like nothing so much as an egg-in-a-nest. “An eagle’s nest.”, he said to himself. Heisenberg pointed to the man’s sunglasses in his watch-coat pocket. The second officer of U-124 donned his sunglasses along with Heisenberg. Heisenberg then flipped a switch to activate the circuit, lifted a switch-cover, and pressed the button under it. A moment later, the horizon began growing brighter in the twilight. This continued until a large ball of light illuminated the submarine; the ocean – everything around them. It was as if the sun had risen out of the ground. Heisenberg was mesmerized. Klaxons hooted. Heisenberg could hear the air rushing out of vents under the deck; he felt the electric motors start. His reverie broken, he dropped through the hatch, followed quickly by the second-officer. Pushed rather rudely aside by a passing sailor, Heisenberg remained there in the conning tower. A moment later, he was shoved aside again, this time by the shock wave traveling through the water. This was why the captain insisted on diving as soon as the device was detonated. The prevailing winds were north and east. U-124 traveled south for half a day, then surfaced. Heisenberg handed the radio operator a message. “Exactly as it is written. Send nothing else.”, Heisenberg said. “It was a good idea to locate here, Herr Doktor. There are never any tourists in Trauen.” Heisenberg reveled in the late-summer/early-fall weather; the peaceful sound of a light breeze in the trees – he’s managed to tune-out the sound of the cranes and other equipment during the ramp’s construction – so when the ramp was completed and the painters came to do their work, the silence was deafening at first. Then, the engine-testing began. Several of them exploded – until they realized that regulating the combustion-chamber pressure was a necessity; it took VonBraun to figure that out, and when he did, the engines exceeded their thrust-goals. The large building which housed the Bird itself was guarded day and night – as were every road for ten miles around. Buying out the local farmers had cost a fortune – but the Party had done so, to guarantee absolute secrecy. While engine tests were still being performed, what had really made it possible to get this far, this fast, was the fact that the nation was not at war. He’d heard that Herr Hitler had contemplated invading France and Poland by late 1939 – and that he’d been talked out of it by Goering and others until the new generation of weapons were ready. He didn’t know much about such things, and like VonBraun, didn’t really want to know. He was happy to have produced the powerplants which saw to it that the nation never paid a power-bill. He was still working on the bomb – and with Hahn at his side, it was closer to completion than he’d dreamed. They had been walking toward one of the buses which shuttled personnel to various parts of the by-now-huge Trauen complex. Heisenberg noticed that there were several important looking people on the bus. Boarding, he and Sanger were introduced by one of their innumerable aides, and given a seat. They traveled the stretch between the research and administration facilities and the beginning of the rail-complex without words. When they reached the rail complex, Heisenberg noted that there was already a crowd gathered in the reviewing area about a half-kilometer away. On the rail, steam coming from the supercooled fuel in the booster and the plane, sat the Silbervogel. “I don’t like it, Mr. President – not one damn bit!” Admiral King and Secretary of War Knox were in the Oval Office with Cordell Hull and President Lindbergh. They were poring over a map, drawn from memory, from a defected junior German SS officer. “This fellow says that the Germans have built this contraption – it looks like a rollercoaster-to-nowhere – and the only thing he was able to learn about the project was one word – ‘Adler’- that’s German, for “Eagle”. Lindbergh sat behind his desk with fingers tented in front of him. After a moment, he spoke. “To get his name in the papers.”, Lindbergh said. “Until I have more proof, I’m not doing anything. Look,” he said, pointing to the front page of the Washington Post, which he held up for all to see. “Economists Fear Recession”, read the headlines. Lindbergh flipped to page five. “Germany Launches Von Richtofen – Largest Carrier Afloat” – in 16pt. type on page five, it didn’t appear ominous at all. “If the Post isn’t worried, I’m not. I think they’ve got their priorities straight.”, Lindbergh said, putting the paper down. Admiral King’s face grew red. He knew this better than anyone. The Essex class aircraft carriers wouldn’t be ready for anything other than testing until perhaps 1943 or ’44 – and the new aircraft from Grumman and Lockheed, while good designs, weren’t the class of aircraft the Germans had designed. The main battle-line of the American navy was based on second-generation dreadnaughts – huge battleships with cage-tower masts and guns which could fire a shell twenty miles. One of these aircraft had a range of five hundred miles – and who knew if the Leutnant from Trauen, Germany was telling the truth – and what this contraption was for. Sanger and Heisenberg walked to the podium together, as the two heads of the respective projects. Sanger was the speechmaker; he spoke briefly about serving the Fatherland; a new era; the usual. They walked to their places, and sat. Walking to the Silverbird from the ready-shack was a man whose photo had appeared in many magazines and newspapers; Hauptmann Adolf Galland, hero of the Spanish Civil War and a bit of a rogue. Heisenberg thought him a show-off; Sanger thought he was perfect. Heisenberg nodded. He was anxious to see the Bird fly. So was everyone. Tests, retests, checks, rechecks – then the technicians began walking away. A klaxon sounded. Sanger nudged Heisenberg; they both put on sunglasses. A brilliant flash – and the massed-thunder of the six engines in the booster split the very sky in front of them in a shock wave which was felt through the feet of every spectator. Involuntarily, Heisenberg put his hands over his ears, as the sound got louder, seeming to shake the very ground under them. Restraints fell away from the rail, and the Silbervogel began to move – slowly at first, then exponentially faster. Suddenly, it was out of immediate sight, moving down the rail at a frightening rate of speed. Galland, in the cockpit, used his radiomicrophone to read the gauges. “250; 300; 400” – he read the speed in kilometers per hour – “I’m off! Airborne!” The audience saw the Bird, now almost vertical, being chased by six yellow-orange flames and a massive shockwave. Then, it appeared that the craft exploded. The crowd gasped – then realized that the craft hadn’t exploded – it has simply created a massive shockwave due to its speed. The audience had witnessed the crossing of the sound barrier. 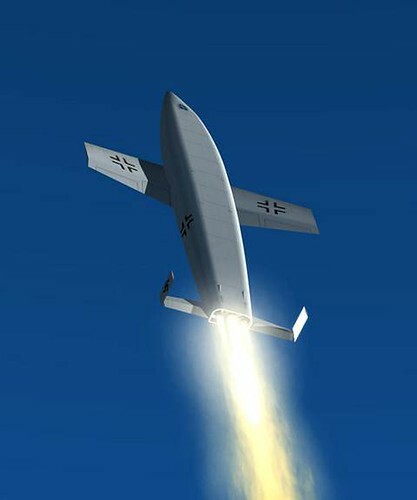 In unimpeded vertical flight, the Silbervogel attained an altitude of a little under eight kilometers, at which point the booster flamed out and was automatically jettisoned. The Silbervogel’s main engines automatically engaged, driving the craft higher. At this point, its velocity was enough to take it to the stratosphere. The main engines were disengaged at twenty kilometers, just as Galland nosed the Bird over. His speed could only be estimated at this point; there were ships in the Atlantic which were listening for his radio-beacon overhead; the data collected could be analyzed later for speed. Silence. Above him, Galland saw blackness. Below, he saw the curvature of the earth. The feeling was much like falling; perpetually – in retrospect, Galland was glad he’d only had coffee to drink that morning. “Surfing” the shockwave created by such speed was still unreal – he had taken a pencil from his flight-suit and let it drop; watching it drift slowly down meant that the craft was nearly weightless due to the combination of speed, forward motion, and gravity. “Just think; if we get those in perfect balance, we can stay up here indefinitely. But how would one get back down again?”, Galland thought to himself. He checked his instruments again; simple and elegant, there was an analog calculation device which gave him longitude and latitude – something which couldn’t be done in a conventional aircraft due to cloud-cover. This gave him all the information he’d need, along with the two chronometers, to perform the second part of his mission. He’d been watching the “is/was” (as he called it), plus the two chronometers on his panel; soon, he’d have to nose the craft downward over the western Atlantic, and begin his mock ‘run’. The test which Sanger had devised was simple. Strange; almost laughable, but simple. Both the primary chronometer and the analog calculator reached the predetermined points at the same time – this meant that the engine thrust-yield was spot-on; another confirmation which he could give Herr Sanger. Galland nosed the Silbervogel over into a shallow dive. Denser air stabilized the craft, and made the second phase of his mission easier. He pressed a button on the panel, and heard the motors behind him whine as the bay-doors opened inward (at that speed, anything which opened outward would have been immediately torn away). He checked the secondary chronometer, which gave him the exact drop-point. He watched intently as the two instruments, chronometer and calculator, reached the same point – the drop was automatic at that point; the only thing he had to do was maintain the proper altitude. About 50 kilometers off the American coast, a bomb-shaped canister dropped from the weapons-bay of the Silbervogel. This triggered an autoswitch which immediately closed the bay doors. Galland nosed the craft up, and fired the engines. The impact slammed him into his seat, and took him skyward again to complete the rest of his journey. “What do the Americans say?”, he thought. “Piece of cake? Ja. Piece of cake.” He settled in for the journey home – which wouldn’t take long. “How long, Herr Doktor?”, said Heisenberg. “A little over an hour and a half.”, said Sanger. The crowd was already getting leaving the bleachers; there was a tour of the facility planned while the test-flight was in process. Heisenberg was bored during the tour – there were people from the Luftwaffe and the Todt Organisation taking alternate turns telling those-present how this was a great day for the Fatherland; a great victory for German technology. While Heisenberg had not expected Chancellor Hitler to attend, in retrospect, he understood why Hitler would not have missed this one for anything. An hour come-and-gone, they assembled back at a different set of bleachers, a couple of kilometers away. Nervously, a lot of the assembled multitude smoked cigarettes and gossiped among themselves. Suddenly, several ‘clicks’ on the ever-present loudspeakers, and the voice of Adolf Galland was clearly heard, along with two of the control-room personnel. “Silbervogel, preparing to land. I have visual.”, said Galland, although his voice sounded like it was squeezed through the ether, much like listening to a shortwave radio. “We have you on radar, Silbervogel.” Some additional directions were stated in the form of mathematics – Heisenberg understood the principles of navigation, but not the language – and then, just as suddenly, he noticed a small silver speck, impossibly high; if it were a normal aircraft, it would be below any possible horizon. Gradually, the speck grew larger; took on form and detail; moved a bit in the air; changed attitude, and began a descent-in-earnest. The field in front of them was newly-paved concrete; clearly demarked and now lighted, even though it was not 2:00PM. Its wings and tail extended, the Silbervogel now nosed up; then deployed its landing-gear. Touching down on the field, the bird streaked down the runway, its national markings on tail and wings now clearly visible. It stopped right in front of the bleachers. Trucks and technicians sprang seemingly from nowhere; producing a ladder and opening the cockpit door, the techs helped a slightly-stiff Hauptmann Galland from his seat to the tumultuous cheers of the spectators, including Chancellor Hitler and his entourage. Adolf Galland had circumnavigated the earth in less than two hours. “Now, it is up to me.”, said Heisenberg, under his breath. “What was that, Heisenberg?”, said Sanger. Much to do indeed, thought Heisenberg. “Ja,” replied Sanger, suddenly distracted from a mountain of material on his too-small desk. “Ja, Herr Doktor.” Sanger summoned an aide and requested a coffee-service. “Under power?”, said VonBraun. His interest was clearly piqued. “What about distance?”, said VonBraun. Fall had given way to winter – while construction was dormant, Sanger and the team had worked insane hours to perfect the design of the Silverbird. The math was sound; final wind tunnel tests had been completed, and full-scale construction of the booster and main engines had proceeded. Winter gave way to spring, and the construction crews resumed digging, mixing, and pouring concrete. The construction of the large pylons and supports were daunting tasks – custom made cranes on large coffers were constructed, used, disassembled, and moved. Day by day, the project inched along – with the goal of late-summer always in mind. “And how are our Eagles, Goering?” Hitler had taken to referring to Sanger’s team as ‘the Eagles’, and the name had stuck; it was the codename that the SS, the Gestapo, and the upper levels of government all used for the project in Trauen. Cordell Hull looked exhausted. The fall of 1939 had revealed that the Japanese were not only in Manchuria to stay, but their I-class submarines had been disappearing from ports, being replaced by two license-built designs from Germany. In Japanese, they were called “Sen Taka” – or fast-attack submarines. In English, they’d not been named – but they were causing havoc amongst America’s allies. “And how in hell do you know that, Cordell?” Lindbergh was equally tired of late, but his exhaustion was based on a fragile economy which was a full ten years in recovery from the worst economic catastrophe since 1879. “Yes – I know–”, Lindbergh said, trailing off the last word and settling back in his chair. Charles Lindbergh, the Republican nominee for President, had the looks, charm, and voice to convince the American people that Roosevelt had seen his day. Two terms were enough, he’d said – “It’s time to take America to new heights!” Invoking his legendary aviator past wasn’t hard – -the country still loved Lucky Lindy. His victory, albeit by a hairline majority, had stunned nearly everyone. In fact, he hadn’t pulled even in the polls until October, and it was a stroke of genius – a self-promoted, self-piloted whistle-stop campaign to every major American city in thirty days in his Lockheed Electra, “America”, which had convinced enough of the American public to vote Republican in the ’36 election. That was three years and a lifetime ago. He was under some pressure, to be sure, from ‘hawks’ in the Congress and Senate to rearm – but the funding simply wasn’t there. He couldn’t economically disenfranchise hundreds of thousands of Americans by putting the nation in debt to buy aircraft carriers. Besides, he believed Herr Hitler. His last meeting with the National Socialist leader in Berlin had convinced him that Hitler was not only the soul of charm and grace, but vision. Hitler had shown him the plans he’d made for the new capitol, Germania – a celebration, Hitler had told him, of their common Aryan heritage. Hitler’s Germany was thriving. In fact, Lindbergh came away nothing if not a little jealous. Time Magazine had named Hitler “Man of the Year” in 1938. He’d built the world’s most modern highway; had electrified every region of Germany, no matter how remote, with electricity which was too cheap to meter – so it was given away on a Party subsidy. Unemployment in Germany was an enviable 3%. The currency was stable. They had a social-welfare system which was better than that of the United States. It almost made Lindbergh wish there wasn’t a Constitution. Lindbergh stood. As with his counterpart an ocean away, this was a signal – a clear one – that the meeting was over. It is a time of peace. Germany, under Chancellor Hitler, set two ambitious goals beginning in 1934 – the rebuilding of the national economy and the creation of a new military. In order to create a new economy, cheap energy was needed on a scale unprecedented in history. While the Ruhr valley dams could and did provide electricity, the needed power for the new National Socialist dream would far exceed any projected supply. Werner Heisenberg and Otto Hahn, two physicists at the Kaiser Wilhelm institute, had concluded in 1932 that nuclear fission was possible. This led to the research necessary for the construction of the world’s first powerplant near Trauen in 1938. Funded directly by Party money, the Trauen complex was the first of ten powerplants which were rapidly constructed by the National Socialists…. Dr. Werner Heisenberg left the main administration building and stepped into the crisp fall air. Early October in Germany was beautiful. The leaves were starting to turn, but the temperatures still reached into the 70’s in the afternoon. It wouldn’t be long before snow fell, but today was beautiful. “Dr. Sanger! I was just coming to see you!”, said Heisenberg. “Really, now? Regarding?” Dr. Eugen Sanger, an aeronautical engineer and Heisenberg’s boss, was in a hurry, as usual. Heisenberg blanched. In medaeval Europe, it wasn’t a good idea to get too close to the King – and Goering was Reichsmarschall; second in many ways to Hitler himself. Mercurial and difficult, both Sanger and Heisenberg had found it was a good thing to speak to some of Goering’s underlings regarding his mood before approaching him. Results were better that way. They entered one of the other administrative buildings on the campus. This was the nominal headquarters of the Todt Organisation – the National Socialist party’s official engineering and construction arm. Obtaining funding through the Party was far easier – but the Todt people actually controlled the labor supply, and anything Sanger wanted had to be approved. “What do you need to build?”, said the Todt representative, a good-natured fellow named Hans, who Heisenberg speculated was a contractor of some sort before being drafted into the Todt Organization. “This,” said Sanger, rolling out his plans. Both Heisenberg and ‘Hans’ drew a collective breath. Sanger’s plans showed a 1:1000 scale – anything larger would not have fit on the two-meter conference table. The plans were for a ramp – starting at ground level, and rising slowly, with the final 1/3 taking a steeper incline until it was nearly vertical. The overall height was a little over 300 meters high. Supported by huge outside angled pylons which looked like flying-buttresses and straight columns from the center, the ramp looked like nothing short of a huge railroad bridge – only there was one rail in the center. ‘What on earth is this FOR?”, said Hans. “It’s for an aircraft. That’s all you need to know,” said Sanger, impatiently. “But – this is over three kilometers long!”, said Hans. “As long as it’s in place by the end of summer. We need to test by then while we still have decent weather left,” Sanger replied. “Now, if you don’t mind, I have other work to do.” Sanger began rolling up his elevation plan; Heisenberg helped with his other papers. Walking back to the research complex, Heisenberg wondered if he should ask his boss about the aviation project. He decided that was probably not a good idea. His function was physics; he left engineering powerplants – or aircraft – to those who knew how. “You’re good at it, if a bit forgetful and unfocused at times. But your ideas might have made my own project viable,” said Sanger, getting back to his aircraft again. “Yes?” Sanger was showing some of his legendary impatience. “Ja, Herr Doktor,” replied Heisenberg. Back to physics. And to keep his mouth shut…. Sanger spoke. 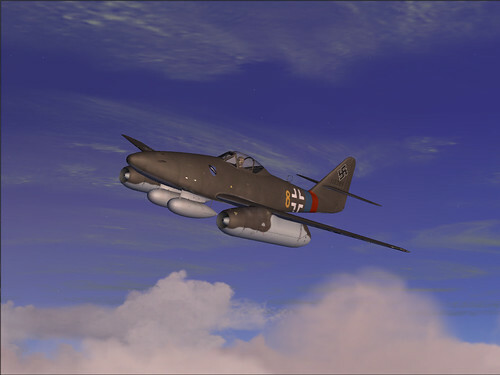 “Herr Chancellor, the Silbervogel” – here, he used the codename “Silverbird” with which Goering was so pleased — “will have a pressurized cockpit and a form-fitting seat – this is for support during the intense pressures of takeoff, but will also provide safety and a degree of comfort for the pilot. All safety precautions are being taken regarding the device, when it is ready.” Sanger didn’t say what the men in the room already knew – the real reason for Heisenberg’s research; the breakneck pace at which they’d constructed uranium-fission powerplants; the experiments with graphite-rods and heavy water. National Socialist Germany was close to producing an atomic weapon. “So, what is the advantage to us if we pour more millions of Reichsmarks into this project, Herr Doktor?” Hitler was impatient; even more so than Sanger, which unnerved him. 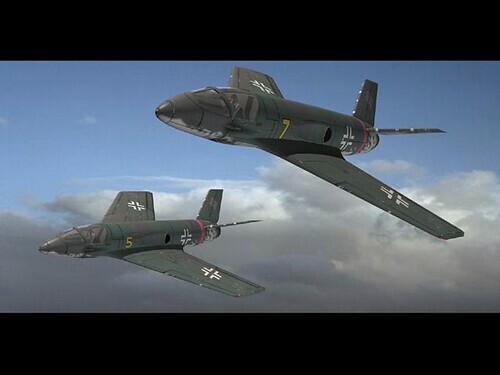 “If the research is fully funded, through the test phase and construction of prototype, I’m reasonably certain we can provide the Reich with an airplane that can fly to the edge of space and land safely,” said Sanger. He waited on tenterhooks for the Fuhrer’s reply. Sanger visibly relaxed; smiling. “You will have the funding you need, Herr Doktor.” Hitler stood. The meeting was officially over. Sanger had the funding for both his project and Heisenberg’s. Now, the only thing to do was work – and work hard; there was much to do….